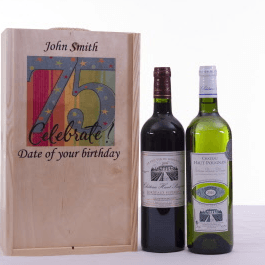 You can put the name and date of a birthday wine gift on the 75th banner with wooden box. This gift is a must buy for someone who appreciates fine wine. 1 bottle of red wine Chateau Haut-Pougnan Bordeaux and 1 bottle white wine of Chateau Haut-Pougnan Entre-Deux-Mers . A beautiful high quality 75th birthday wine gift. You can choose the wine either 1 red 1 white, 2 red or 2 white. In the heart of theEntre-Deux-Mers in the Bordeaux wine producing region, near Creon,. The vineyards of Chateau Haut-Pougnan spread on the slopes of the right bank of the Garonne, superb clay-limestone soil and gravel, that is the nature of calcareous clay these soils resulting in very fine wines with subtle bouquet. The vineyards of Chateau Haut-Pougnan spread on the slopes of the right bank of the Garonne, superb clay-limestone soil and gravel, The slopes are home to East and South vineyards reds, the slopes West remain the domain of white wines. The red wine, rich, fruity has a tanicity particularly well balanced, on a beautiful dress, he continues to please with its elegance and balance in the mouth.